Poised perfection, the following 5 dancers have been on our radar since very early on. We have watched them dance and grow and we could not be more proud of their hard work and accomplishments. These young Brown Ballerinas are dedicated dancers who are both intelligent and talented, just 2 of the reasons that they are our very first '5 to Watch'. Olivia Winston is one of those girls who was just born to dance and move! She began her dance training at the age of three at her neighborhood studio where she studied tap, jazz, and ballet. At the age of four, after spending about a year balancing on her head, doing back-bends, and self-taught one-armed cartwheels up and down the field at her older brother’s flag-football games, her parents also enrolled her in the pre-TOPPS program at USA Gymnastics, where she was fortunate to spend time training with Natasha Tokareva, a former Russian National Coach and her husband and training partner, Yuri Tokarev, medal-winning athlete for the USSR. Many summers were spent in the gym and at local dance camps training in a variety of dance genres, but upon attending Ballet West Academy’s summer program at the age of eight, she discovered that her true love was ballet. She auditioned for the role of buffoon in Ballet West’s production of The Nutcracker that fall and hasn’t looked back since. As an Academy member, Olivia has been fortunate to dance many roles in company productions including Aladdin, The Little Mermaid, and Sleeping Beauty. She was privileged to be in a commercial for the Academy last year and represent the Academy while competing in YAGP for the first time this winter. She is currently an intermediate student in Ballet West Academy's pre-professional division. Summers are now spent at ballet intensives: Ballet West and Joffrey NYC Young Dancer in 2013 and Ballet West/University of Utah and ABT Austin in 2014. She is very much looking forward to spending this summer at ABT NYC. In addition to her own ballet training, Olivia recently began volunteering weekly in Ballet West's adaptive dance program, "Movement Mentor," which pairs advanced Academy students with students with various special challenges for a one-on-one dance experience. Chynna Jaide Prescott lives in Cypress, California. She is eleven years old and in the sixth grade. Chynna currently receives her dance training at Impact Dance Center located in Los Alamitos, California. She has danced with Impact since the age of three, has been a member of their competition team since the age of six, and a member of their Ballet Conservatory since the age of seven. Chynna currently trains six days a week in Ballet, Pointe, Jazz, Lyrical, Tap, Hip Hop, and Acro. Chynna has been extended invitations to several summer intensives including: School of American Ballet New York 2015, School of American Ballet California 2014 and 2015, The Rock School for Dance Education, Joffrey San Francisco, and Maple Conservatory of Dance Summer Intensive for Intermediate/Advanced just to name a few. She has been fortunate to perform at the Hollywood Vibe National Finals Gala 2014-Ensemble, Disneyland (2013 and 2014), and has also performed as Clara in the The Nutcracker, Figaro in 'Pinocchio', Impact Dance Center's Ballet Conservatory Spring Shows 2012-2015, Various Dance Competitions & Nationals (2009-2014), and Impact Dance Center's Winter Fantasy (2007-2014). Chynna is proud to have trained under the tutelage of Andrea Brache, Michelle Hamilton, Melissa Sandvig, Ana Falley, Jesse Gonzales, Catherine Conrad Gray, Hailey Bundrant, Nancy Kindorf, Shawn Kurilko, Shawn Kindorf, Aisha Gibbs, Jason Gorman, Victoria Acker, Tawny Chapman, Chadd Moreau, and Sarah Rayburn. Young but accomplished, Chynna has received several awards including: Velocity Nationals Scholarship Recipient (2015), LADanceMagic Year-long Scholarship Recipient (2013 and 2015), Hollywood Vibe "Team Hollywood Vibe" Year-long Scholarship Recipient (2014), LADanceMagic "Magic Performer of the Weekend" Scholarship Recipient (2014), Spotlight Dance Down Sapphire Recipient (2014), CoDance/NRG Regional Scholarship Recipient (2014), Hollywood Vibe Nationals Scholarship Recipient (2014), and CoDance Regional Scholarship Recipient (2013). Izabella is a native of Ceres, California where she attends Central West Ballet Academy under the direction of both Rene Daveluy & Ballet Mistress Leslie Larson, where she is enrolled in Ballet, Jazz & Tap classes. She is currently also is enrolled at Steps Dance Arts Center, where she received her foundation of dance under the direction of Ms. Charlotte Ewing & April Doran, where she takes Ballet, Tap, Hip Hop and Jazz. Izabella also has additional training in an array of traditional/regional dances from Mexico with Ballet Folklorico Viva Mexico under the direction of Norma Torres-Manriquez. Izabella has attended numerous Summer intensives: (2008-2010) Summer - Ballet San Jose -(Director Lise LaCour), (2011-2012) Summer - Central California Summer Dance Conservatory-(Director David Arce), (2012-2013) Summer - Contra Costa Ballet -(Director Richard Cammack), (2012-2014) Summer - Central West Ballet -(Director Rene’ Daveluy), (2014-2015) Houston Ballet – (Director Stanton Welch). Izabella has also attended master classes at ABT West & Ballet San Jose as well as workshops with Dance Master of California-(Chapter 13). Izabella has performed the lead of “Alice” in Alice in Wonderland in (2010) for Steps Dance Arts Center, “Clara” in the 2012 Nutcracker for Central West Ballet-(Resident company of the Gallo Performing Arts Center), 2013 guest artist as “Ballerina Doll” for Central West Ballet, “Cinderella” in 2014 for Steps Dance Arts Center, and “Sugar Plum Fairy” 2014 Nutcracker at Steps Dance Arts Center. When Izabella isn’t in class herself she is a teacher’s assistant/demonstrator with the Turlock Parks & Rec./Dance Etc. Program and the Ceres Parks & Rec./Dance Program hosted by Steps Dance Arts Center, all under the direction of Charlotte Ewing. 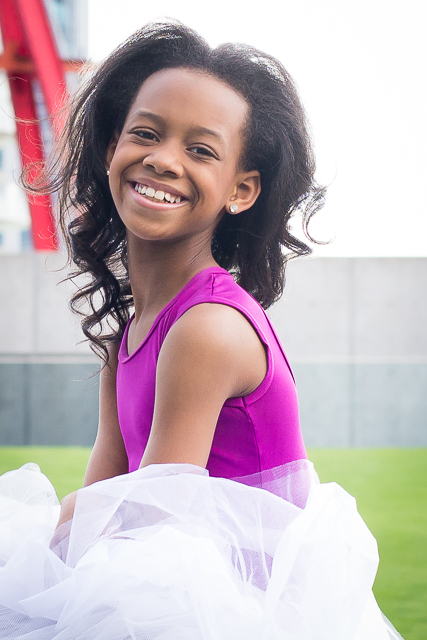 She’s 10, she’s tenacious, and she’s ready to take the dance world by storm! Olivia Bell, a native of Arlington, Texas, enjoys all of dance, but she loves Ballet the most. She began dancing when she was just two years old, and has aspired to be a professional dancer since she could say the words, “professional dancer.” She attends Fort Worth Academy of Fine Arts where she studies dance during the school day, and is a member of the Junior Dance Company. Outside of school, she studies ballet, jazz, tap, African and modern dance at Dian Clough West School of Dance and Dallas Black Dance Academy, and is a member of the Junior Performing Ensemble at Dallas Black Dance Academy. In 2014, Olivia spent the summer dancing on scholarship in New York at the Dance Theater of Harlem Summer Intensive, where she performed a work by Arthur Mitchell and received special recognition for outstanding achievement in African dance. In 2015, she was accepted to and plans to attend the American Ballet Theatre Young Dancer Summer Workshop in New York. Olivia has received many awards and scholarships for dance, and recently was named Regional Elite Dancer by West Coast Dance Explosion. Alysia Johnson is a native of Dallas, Texas where she attended Booker T. Washington HSPVA under the direction of Lily Weiss. Her initial training was received at the Dallas Black Dance Theatre’s Academy where she was enrolled in ballet, modern, jazz and African. She currently attends The Juilliard School as a freshman dance major. She has performed works by Dwight Rhoden, Christian Von Howard, Christopher Huggins, Bruce Wood, and Robert Battle. Ms. Johnson received additional training and studied abroad at Lines Ballet, School of American Ballet, Dance Theatre of Harlem, and Alvin Ailey American Dance Theatre. She has also performed as a guest artist with Dallas Black Dance Theatre I and DBDT II in their 2013-2014 season. Alysia was a 2009-2012 recipient of the Texas Young Master Scholarship Award along with winning a National Merit title from the Young Arts foundation.